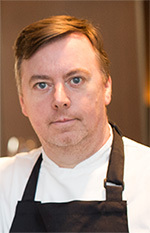 THE MAN BEHIND THE PASS Jim Mullholland Le grand chef, who is highly respected in the industry, first came to Jean Christophe Novelli’s attention in 2016 when he cooked for him at Ballyrobin Country Lodge, making a memorable impact both for his food and his personality. A local chef with many years of experience working with local suppliers and producers using some of Ireland’s finest ingredients. We are always on the lookout for talented and passionate individuals to join the Novelli team. You will have the opportunity to be part of a growing brand and to do what you love by delivering outstanding service, no matter what area of the business inspires you.